Sorry, but can you please explain what/why you need more resolutions/timings? The details behind these numbers are available from this post. In case you don't know what is a front-porch, back porch etc. I would suggest to use google/wiki for studying this. Only you (or others using the same screen as you) will be able to support you in 'finding' the right timings. In case of using a TFT the timing detials are in the spec sheet, so you can start working from this. With 1920x240 timings and NO Hardware Bilinear Filtering, the result is ... Wonderful/Awesome !! This software is not to calculate CRT timings but can be used to. Use "Detailed resolution" - "Edit BUTTON" and Play ! Sorry, but can you please explain what/why you need more resolutions/timings? Those timings would only be useful if the display supports them. If not, you may be able to use the framebuffer settings and let the hardware resize the displayed output to fit the screen. Hi, it seems that we are trying to achieve the same goal by different starting points. On the Recalbox forum I proposed to use the VGA 666 as "breakout" for CRT TV (ironic-FR, I'm Scandy ). Then I saw on Youtube the video of d33pblue. At least for arcade emulation, IMHO there is no need to search for each single video mode. Actually I've compiled and tested latest release (1.5) on my good old RPi 1, and in HDMI (my VGA 666 is on the go) actually it does switch automatically to the best / more faithful resolution available for each single game (if device_video_clock in advancemame.rc allows it). My idea, when I will receive the VGA 666 and the VGA - SCART cable, is to understand better how to combine the two. In the meantime I'm in contact with Andrea (author of AdvanceMAME) to inform him about all these possibilities. It seems that the creation of custom video modes with non-square pixel (very common in arcades) is actually possible via HDMI / GPIO through a "bug" of the firmware which makes the parameter sdtv_aspect = 1 valid also for the HDMI output. For the latest firmware update we have proposed to transform this "bug" in a feature that really opens up many new possibilities in preservation and emulation of old hardware. antiriad wrote: Hi, it seems that we are trying to achieve the same goal by different starting points. What you need to bear in mind is that, when you change the framebuffer resolution on the RPi, the RPi's framebuffer driver actually uses GPU scaling to create the new display mode. 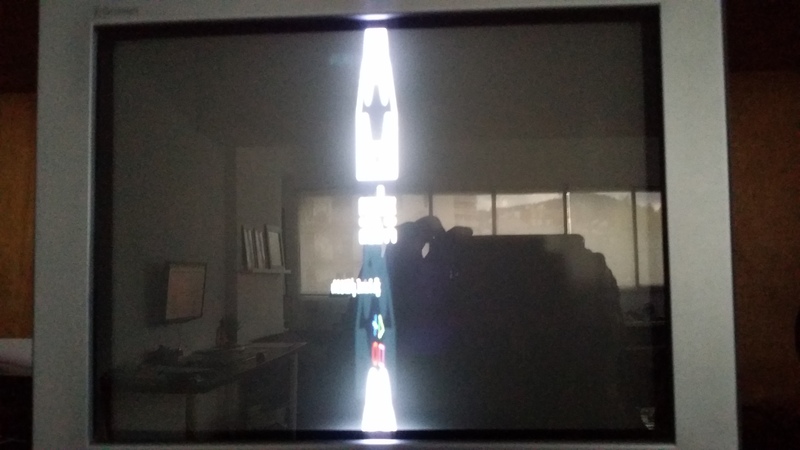 The signal being sent to the TV/Monitor doesn't actually change at all. This is very different to how most (all?) Linux framebuffer drivers work in the PC world. If you change the framebuffer resolution on a PC running Linux, the actual signal being sent to the monitor is changed. I mention this because Advance MAME uses the framebuffer driver to create custom screen resolutions, and therefore, on the RPi, Advance MAME doesn't actually create 'perfect' video modes with the correct size and clock. If you're using a modern LCD monitor this doesn't really matter, because ultimately, the image will always be displayed at the monitor's native resolution, with the scaling being done by either the monitor itself, or the RPi's GPU. However, if you're using an older CRT monitor, you will obviously get better results by creating a genuine custom video mode with the correct size and clock. This setting basically gives Advance MAME complete freedom to create any display mode it wants. On the RPi, there is no need to place restrictions on what modes can be created (based on the scanning range of your monitor), because the signal to the monitor is not actually changed. What people who use CRT monitors really need is a reliable means of creating custom display modes on the RPi without having to carry out a reboot. I started a thread on GitHub about this issue some time ago, and I notice that Andrea has just contributed to it. As you're in contact with Andrea, could you ask him whether a facility could be added to Advance MAME to enable a shell script to be run (with appropriate parameters) every time a custom display mode is required. This shell script could then run the vcgencmd, tvservice and fbset commands, with the supplied parameters, to enable the custom mode to be created. Hi Grasshopper2, just take a look at latest AdvanceMAME release (3.0) with official Raspberry support. If properly set (after setting device_video_clock, also display_adjust should be set to generate_) it gives real native resolution with vcgencmd (of course only on HDMI and GPIO video output). Nice. I didn't realise that Andrea Mazzoleni was still actively developing Advance MAME. But are the new v3.0 features documented anywhere? I'm not seeing any RPi specific instructions anywhere on the website. The documentation of AdvanceMAME for Linux is now valid also for RPi. antiriad wrote: Here the changelog. I'm still not seeing anything specific. 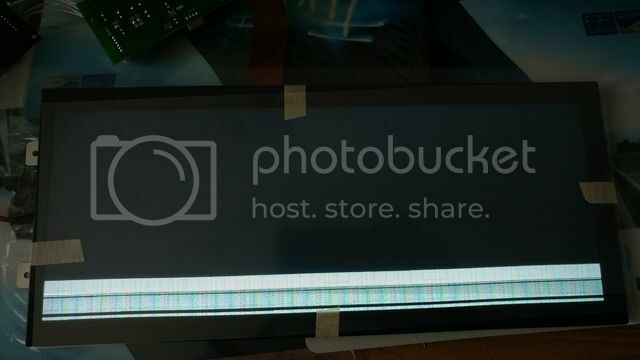 All the instructions say is that "With a Raspberry Pi you have the same support you have in Linux, plus some specific Raspberry functionalities, like the accelerated Framebuffer". But no further details are provided about the specific Raspberry Pi functionalities. Maybe I should contact Andrea directly, or start a new thread about Advance MAME 3.0. Do you know whether Andrea has an account on this forum? Grasshopper2 wrote: Maybe I should contact Andrea directly, or start a new thread about Advance MAME 3.0. Do you know whether Andrea has an account on this forum? For sure you can start a new thread on AdvanceMAME forum but I can't understand what do you mean with "specific Raspberry Pi functionalities". Previous versions of AdvanceMAME had serious issues on RPi about audio, vsync etc., but Andrea has finally released this 3.0 version with official RPi support. This means that, by now, you can easily compile AdvanceMAME on RPi and have same features of a PC with Linux/DOS (best video mode via framebuffer, or native video mode even at 15 Khz on arcade monitors) because now AdvanceMAME use specific instructions also for RPi (accelerated FB and vcgencmd for video mode switch). No specific or further documentation is really needed for RPi apart from the docs yet on the website. mortaca wrote: ironic-FR I am using CRU 1.3 and does not generate the same values as you. The value you're indicating are ideal/theoretical, but current rpi implementation support only a limited set of pixel freq (4800000, 6400000, 9600000...) hence in your example you had pixel clock of 6080000 which is not supported. 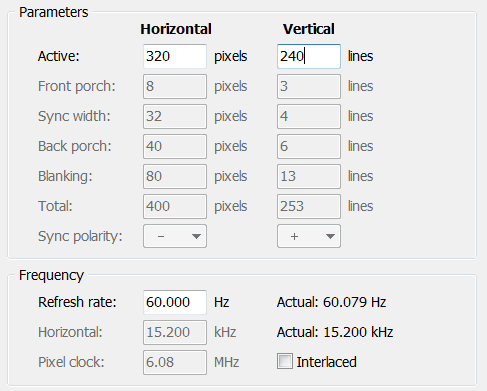 This tool is usable in the following way: first set CRT standard with resolution you want in 60Hz, then adapt pixel clock with rpi compatible one (increasing will result of narrower result and decreasing will result of more overscan) calculate vsync width using rule of three then play with back & front porch in order to be close to 60Hz for vertical and 15Khz for horizontal. If the screen is not well centered then balance between front & back porch. I'm an owner of a DELL U2913WM and after the update to KODI 17 the custom hdmi mode doesn't work anymore. After some trouble, now it works again for me and i'm happy to share this to anybody whos need. If you had some improvement, please share it. With a bit trial and error I finally found the 576i HDMI setting in hdmi_timings, as to be able to modify these timings slightly, but I'm afraid my cheap chinese HDMI to CVBS converter just can't cope with PAL-color well, as the upper part of the screen has a color error. Luckily my TV supports NTSC-color even with PAL-timings. By the way, the pixel_rep-value of 2 makes the pixels wider with a higher pixel-clock. Does anyone have any tips on how to fix it? Love to find source code to CRU so it's useful under something besides Windoze. There was a modeline calculator I think, videogen in the Raspbian debs is close, not what I'm thinking of. It's marketed as a TV with HDMI, VGA and RCA inputs, also has a built-in DVD player, comes in several sizes from 13 to 42 inch, runs on 12 volts, plays MP3s, and it's cheap being Chinese. https://www.axessusa.com/product/tvd180 ... dvd-player I've had mine about 6 months and still like it. Paid $140 for the 13 inch version. Last edited by ab1jx on Mon Mar 27, 2017 6:21 pm, edited 1 time in total. In the middle of a MagicMirror project, but having some (hopefully) timings related issues. I'm using a CLAA102NA0ACW panel on a VS-TY2662-V1 controller. While I can get an image, the colours are hilariously wrong, text is hard to read and seems to "wobble". This happens both with my Rpi and my laptop. I honestly don't know enough about the topic to be sure if this can be fixed by timing changes or not, I suppose it could also be damaged hardware or pretty much anything else. If anyone is able to point me in the right direction, I'd be hugely appreciative. So far, I've tried using config_hdmi_boost=4 to no avail, as well as trying out hdmi_cvt=1024 600 60 and forcing the use of that profile, but neither have solved the problem. I'm curious if anyone has created custom 21:9 hdmi resolutions, such as 2048 x 864, or 1920 x 800? I have a 12.3" bar type (ultra wide) LCD with 1920x720 pixels resolution. When I set the config.txt to this resolution I get some distorted pixels at the bottom of the LCD. Any ideas how I can get rid of them?